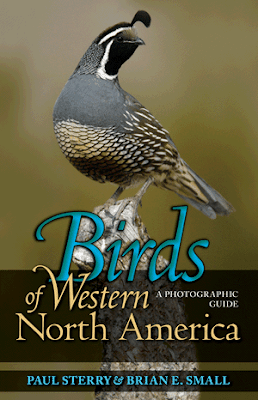 Having seen some recent reviews and bird magazine advertisements for Birds of Western North America: A Photographic Guide by Paul Sterry & Brian Small, published by Princeton University Press, it looked impressive enough that I bought a copy online for well below list price. Here are my thoughts about this new bird guide. 1. Stunningly beautiful! The photography is fantastic and very enjoyable to look at. 2. 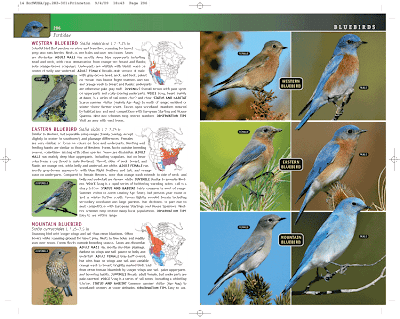 The layout is more contemporary and colorful than traditional bird guides. The top left page corner has a photo to tell you what section of the book you are in and the right page upper corner has the family of birds. As you thumb through the book it is easy to quickly find the category of birds you are looking for, which kind of makes up for the lake of the quick index popular in the latest field guides. 3. This is a bird guide book, not necessarily a "field guide". The cover is cardstock paper, not vinyl so it wouldn't stand up to the elements. 4. Plummage variations are shown pretty well, but artist renderings generally show more. Shorebird variations in this book are particularly good. 5. Comparisons to similar species are excellent. 6. Maps show summer, winter, and year-round locations. I do like to see the migration areas on the map the way Sibley's does, but these maps do not. These maps do show state/province borders and I like that. 7. They really maxamized the space on each page. Text cuts nicely around the maps. Photos of birds spill over into the photos above and below so that the photos are as large as possible. This creates a very cool effect as you look at each page. This book will be wrapped up and put under the Christmas Tree for me. I am certain my kids will be excited about looking through this book, much more than my Sibley's and Nat-Geo field guides. The colors, layout, and photography just beg you to look at them.